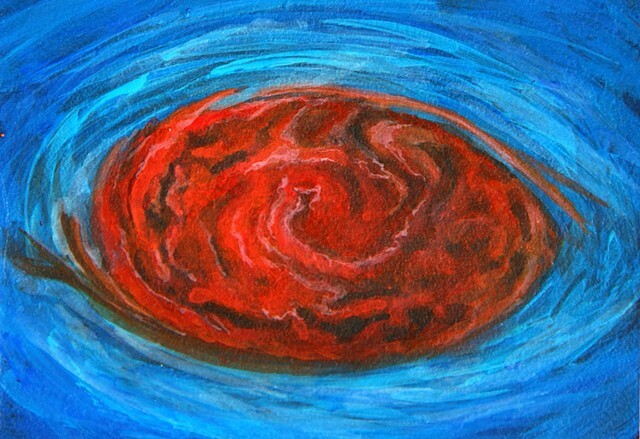 This painting is an interpretation of an amazing image of Jupiter's Great Red Spot taken by the Juno mission cameras in 2017. This area of the planet is comprised of a gigantic raging storm with 400mph winds! It's encased by two jetstreams, which cause the storm to swirl in an opposite pattern to large storms on Earth. Scientists are still trying to determine what is affecting the gases in the storm to produce its distinctive red color, so stay tuned as we learn more about this beautiful gas giant!